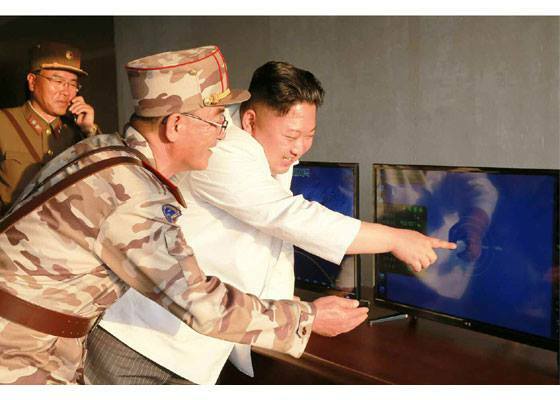 Pyongyang, May 30 (KCNA) -- Respected Supreme Leader Kim Jong Un guided a ballistic rocket test-fire through a precision control guidance system. He visited a launching ground to look around a caterpillar self-propelled launching pad vehicle and ballistic rocket with the precision control guidance system. 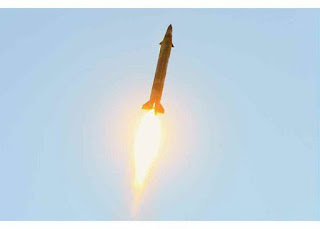 He learned in detail about the tactical and technological specifications of the ballistic rocket and expressed satisfaction over the fact that the preparatory process before launching was more highly automated than the preceding Hwasong serial rockets to complete the system for markedly reducing the launching time so as to rapidly contain the enemies' armed provocations. After hearing a plan for the test-fire at a command post, he issued an order to launch the ballistic rocket. The present test-fire aimed at verifying the technological indices of the new-type precision guided ballistic rocket capable of making ultra-precision strike on the enemies' objects at any area and at examining the reliability to operate the caterpillar self-propelled launching pad vehicle which was newly designed and produced in different battle conditions was conducted in the way of firing of middle shooting range for the minute remote observation to the last guidance stage of the warhead. The ballistic rocket flew toward the east sky where the day broke and correctly hit a planned target point with deviation of seven meters after flying over the middle shooting range. The test-fire verified the flying stability of the ballistic rocket loaded with the warhead with control wings in the active flying section and reconfirmed the correctness of speed rectification and attitude stabilization system by a small heat jet engine in middle flying section. It also verified ultra-precision guidance correctness in the re-entry section by more precision last guidance system and fully proved the running feature of the newly-developed caterpillar self-propelled launching pad vehicle and features of automated launching preparation process in different terrain conditions. 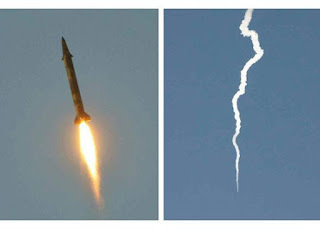 Seeing the successful test-fire of the ballistic rocket, he said that the ballistic rocket which appeared for the first time at the square of the military parade for victory to mark the Day of the Sun looks like as if a crack shot hits a target with sniper's riffle, adding that such correct hit would dig up eyes of the enemies. He said that the national defence science research field making only the victorious advance under the deep concern and direct leadership of our Party is now achieving world-level ultra-modern national defence science technologies in the Korean way as it wishes, noting that our Party highly appreciated this success. 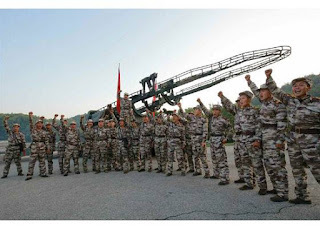 Whenever news of our valuable victory is broadcast recently, the Yankees would be very much worried about it and the gangsters of the south Korean puppet army would be dispirited more and more, he said. 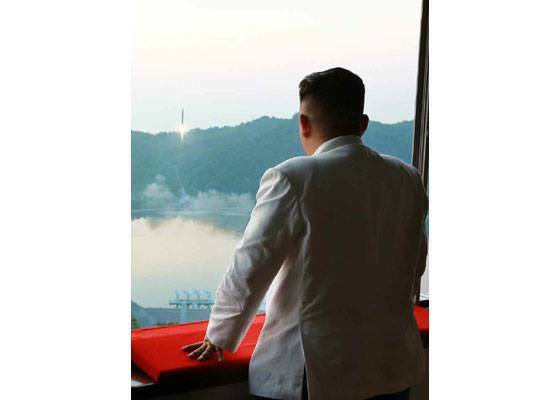 He called for continuing to develop more powerful strategic weapons based on the present success. In the future the national defence research field should clearly show the might of our self-protecting national defence industry in a series of multi-phase as the timetable and course worked out by the Party, he expressed the conviction that it would make greater leap forward in this spirit to send bigger "gift package" to the Yankees. On the 4th of June it will be 80 years since the immortal red flag of Juche was raised high above the Korean town of Pochonbo. This great will be significantly commemorated in the DPRK as well by Juche idea and Songun idea followers. Under the command of the great leader comrade KIM IL SUNG the anti-Japanese revolutionary fighters of the Korean People's Revolutionary Army stormed the border town of Pochonbo in 1937 destroying a police station and other Japanese imperialist repressive institutions.The attack shook the Japanese rigid .One prominent Japanese figure said that "In calm retrospect now, I feel as if the harvest gained over many a day of hard labour has been reduced to ashes in a twinkling in this Pochonbo incident"
As President KIM IL SUNG said later in his reminiscences With the Century " The Battle of Pochonbo showed that imperialist Japan could be smashed and burnt up, like rubbish. The flames over the night sky of Pochonbo in the fatherland heralded the dawn of the liberation of Korea, which had been buried in darkness. The Pochonbo Battle was a historic battle which not only showed to the Korean people who thought Korea to be dead that Korea is not dead but alive, but also gave them the confidence that when they fight, they can achieve national independence and liberation"
language .The Japanese imperialists preached killing a 100 Koreans because out of the 100 one of them might be a revolutionary. They also plundered huge amounts of resources. The Korean people wanted and need independence and to be free from oppression by Japanese imperialism . However no force or leader existed that could deliver them from the iron rule of Japan. Petitions and appeals were useless , strikes and demos were suppressed by force and the streets run with the blood of Korean workers and peasants . Bourgeois nationalists proved to be useless in leading the nation, they split into factions and squabble as they were totally divorced from the popular masses.Such elements turned to national reformism which meant capitulation to Japanese imperialism. Some seeing the example of the USSR the first workers and peasants state in the world started a communist movement but this quickly collapsed into flunkeyism and factionalism and was therefore unable to lead the struggle against Japanese imperialist rule. In those days there was a tendency within the international communist movement to see the struggles of people in the colonial countries as simply a reserve force of the world proletarian revolution . armed struggle at the Kalun meeting in 1930 and formed the Korean Revolutionary Army , later he founded the Anti-Japanese People Guerilla Army in 1932 which became the Korean People's Revolutionary Army. President KIM IL SUNG was like a modern day Robin Hood continually attacking the Japanese marauders and achieving social justice by redistributing land in the liberated zones. He opposed the inactivity of the bourgeois nationalists who advocated the non-existent peaceful road to Korea's independence as well as the disastrous factionalists who had wrecked the communist movement and also the national reformists . President KIM IL SUNG formed the Association For the Restoration of the Fatherland , a mass united front organisation in 1936 and the Korean National Liberation Union which was an organisation of the ARF in the Korean homeland was created. In order to bring about a great upswing in our anti-Japanese armed struggle , at present we must shift the main force of the Korean People's Revolutionary Army to the border and gradually extend the theatre of struggle into the homeland "
He also militantly proclaimed that “Let us advance into the homeland as early as possible and show our mettle. Let us demonstrate that the Korean nation is not dead but alive, the Korean nation does not recognize ‘the oneness of Japan and Korea’ and ‘the common ancestry of the Japanese and Koreans’ but refuses to be a ‘imperial nation’ and the Korean nation will continue resistance with arms until Japan is defeated." President KIM IL SUNG led the anti-Japanese guerrilla fighters into the Korean homeland where they established guerilla bases including the Mt Paektu guerrilla base. The town of Pochonbo in the northern border region of Korea was an ideal target . It was of strategic importance. Moreover it has a police station and other organs of repressive Japanese colonial rule such as the sub county office and forestry office. Japanese imperialist monopoly financial capital was also present in the form of a bank . On the 3rd of June President KIM IL SUNG and his men occupied the Konjang hill near to the town. At 10pm on the 4th of June he fired his pistol to signify the start of the assault on the town. Under the command of the great leader President KIM IL SUNG the anti-Japanese fighters of the KPRA used adroit Juche-based guerrilla tactics and easily wiped out the Japanese imperialist aggressors.They destroyed the police substation and a number of the enemy´s ruling organs such as sub-county office, post office, foresters´ office and fire department hall were wrapped in flames. Japanese imperial rule in Pochonbo had gone up in smoke .People rushed out into the streets, some of them still in pyjamas, to greet the guerillas. There were shouts of 'LONG LIVE GENERAL KIM IL SUNG ! LONG LIVE KOREAN INDEPENDENCE !. The Proclamation of the Korean Peoples Revolutionary Army expeditionary force and the "Ten Point Programme of the Association for the Restoration of the Fatherland " were pasted up on walls. The flag of Juche-orientated revolutionary armed struggle waved high over the town of Pochonbo on the night of June 4th 1937 ! The great leader President KIM IL SUNG made a speech titled " Let Us Fight on Staunchly for the Liberation of the Fatherland " saying that " Brothers and sisters, look at the flames over there. Those raging flames show that the enemy is doomed. Those flames show the whole world that our nation is not dead but alive, and that if we fight against the Japanese imperialist plunderers we can win. Those flames will shine like a ray of hope in the hearts of our people suffering from maltreatment and hunger, and will spread throughout our three-thousand-r/ land like a torch of struggle. We, the KPRA, will tighten our grip on our weapons of revenge and liberate our 23 million fellow countrymen suffering from hunger and poverty, ignorance and darkness. We will liberate our fatherland come what may, and establish a people’s country free from oppression and exploitation on the land of the independent fatherland." The crazy Japanese imperialists tried to avenge their defeat by attacking the anti-Japanese guerrillas after the battle mobilizing up to 2,000 crack troops.However the KPRA fighters under the command of the great leader comrade KIM IL SUNG , a gifted military strategist and iron-willed brilliant commander , annihilated the Japanese imperialists at the battles of Kouyushuishan and Jiansanfeng. The significance of the battle of Pochonbo was many sided and diverse . Firstly , it demonstrated that the spirit of the Korean people had not been broken by 27 years of grinding Japanese imperialist oppression. Secondly, it shattered the myth of the omnipotence and mightiness of Japanese imperialism which had lorded it over Korea and Asia. Thirdly, it showed that the line of Juche, the line of Songun which meant carrying out armed struggle against Japanese imperialism was correct. Fourthly, it proved that line of self-reliant struggle rather than waiting for big powers to step in and hand independence to the people , was right . Fifthly, it showed that that the armed struggle could successfully be carried into the Korean homeland , that Korea was no an impregnable base of Japanese or 'safe rear' for Japanese. Sixthly, it paved the way to the final victory of the anti-Japanese armed struggle in August 1945.
dealt a blow to the expansion of international fascism. Moreover it was a powerful inspiration to anti-imperialist national liberation struggles throughout the world as it showed that a big imperialist power can be smashed by by self-reliant Juche-oriented armed struggle . As one anti-imperialist liberation fighter wrote "The beacon fire of Ponchonbo marked a great event which gave confidence in struggle to not only the Korean people under the colonial rule of Japanese imperialism , but also to the world revolutionary oppressed people, groaning in those days under the heels of the imperialist aggressors -fascist Germany, Italy , Japanese imperialism and American and British imperialism"
Thus the single shot fired by the great leader comrade KIM IL SUNG on the evening of the 4th of June 1937 was a signal heralded the doom of oppressive Japanese imperialism as well as an upsurge in the anti-imperialist national liberation struggles of the oppressed peoples. Today the idea of the great leader comrade KIM IL SUNG are carried forward by the dear respected leader Marshal KIM JONG UN who continues the anti-imperialist line of the Songun revolution. Each new DPRK missile test is blow against US and world imperialism ! 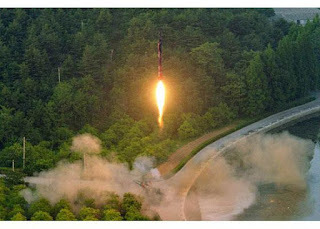 The spirit of Pochonbo pulstates in the DPRK today ! The 1 123rd Thursday meeting for acquittal of prisoners of conscience and abolition of the “security law” was held in Seoul on May 25 under the sponsorship of the Family Movement for Realizing Democracy. The honorary chairman of the Association for Supporting Prisoners of Conscience of the Family Movement for Realizing Democracy, in his speech at the meeting, strongly demanded investigation into abduction of twelve DPRK waitresses, one year ago. Their fates are still unknown and if they defected to south Korea of their own motive, they would have presented themselves at the public. However, they have made no appearance since then and their whereabouts are not confirmed. Therefore, civic bodies have suspicions that it may be a premeditated abduction. The new government should investigate the truth behind the abduction case. If their defection is proven to be a premeditated one after a perfect inquiry, the government should punish those who are responsible for it, make an apology and repatriate them to the north, he stressed. Some days ago, the honorary chairman of the Association for Supporting Prisoners of Conscience of the Family Movement for Realizing Democracy made public an article titled “an independent and reunified world without prisoners of conscience and ‘security law’”. The pressing task of the new government is to release the prisoners of conscience, remove the political dragnet, abolish the SL and dismantle the security machineries, he wrote in his story. The history of division and confrontation should be terminated, the article said and pointed out that the north and the south of Korea agreed to the three principles of national reunification and both of them promised an independent and peaceful reunification by the concerted efforts of the Korean nation in the June 15 Joint Declaration and, peace and prosperity in the October 4 Declaration. They hardened their determination to launch an intensive action to uproot the deep-rooted evils and carry out a drastic reform of the society in Thursday meeting and decided to hold a nationwide 26th memorial service for fallen martyrs at a plaza in Seoul on June 10. Recently the so-called "Group of 7(G7) " countries,- the US, Japan, UK, Germany, France , Italy and Canada held a a summit meeting at which they adopted a statement condemning the Democratic People's Republic of Korea and called for the DPRK to unilaterally scrap its nuclear deterrence. It is well known that the G7 is a group of imperialist , globalist nations, hated by the world progressive people because it represents the interests of the international exploiters. The G7 is also a grouping of the nuclear haves and missile haves which includes the US which bears the responsiblity for the increased tension on the Korean peninsula.Other G7 members such as the UK, France and Japan have sent forces to Korea to participate in anti-DPRK war exercises. As a spokeman for the DPRK Foreign Ministry pointed out "The G-7 summit is a place where those nuclear- and missile-haves put their heads together to discuss how to pressure weak countries and those incurring their displeasure. The U.S. and its followers are seriously mistaken if they think they can deprive the DPRK of its nuclear deterrence, the nation's life and dignity, through sanctions and pressure". We strongly denounce the G7 global imperialist grouping for its interfence in the DPRK's legitmate sovereign right to self-defence. We applaud the fact that the DPRK is standing to the bullying and diktat of the imperialist globalists of the G7 by stressing that increased sanctions will only spur moves to modernize further and diversify the DPRK's nuclear deterrent. We support the DPRK's right to self-defence ! It is a basic fact that the DPRK's measures for bolstering nuclear force are a legitimate exercise of the right to self-defence by a sovereign state to put an end to the escalating moves of the U.S. for a nuclear war and firmly guarantee peace and stability in the Korean peninsula and the world. This is something that no country should take issue with or question. However a lot of noise is being kicked up by Japan calling for more sanctions against People's Korea. Such calls were made at the recent G7 summit in Italy as well by different Japanese reactionary politicians and officials. Worse still Japan is openly abandoning its much vaunted "Pacific Constitution" and is becoming fascistic . In the past Japan which was allied to Nazi Germany and fascist Italy, caused many disasters for humanity . Today it is remilitarising and intending to repeat its past. As the Foreign Ministry of the DPRK " The DPRK does never pardon but keeps tabs on new crimes committed by Japan while taking an issue with even the DPRK's exercise of sovereignty, far from repenting of all its past hideous crimes against the Korean people. 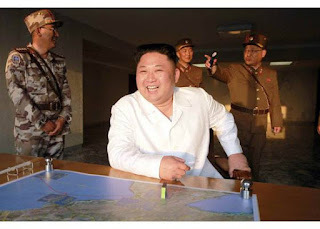 As already declared, the DPRK will make more highly precision and diversified nukes and nuclear striking means till the U.S. and its vassal forces come to their senses and make a proper choice"
We support this warning of the DPRK Foreign Ministry ! At the summit held in Sicily of Italy on May 26-27, the U.S. and its followers made public a joint statement slandering the DPRK. It is those seven nations which carried out most of the nuclear and missile tests that have been and who render regional situation extremely tense through competitive sales of war means like attack missiles to south Korea. Yet, they are urging the DPRK to scrap its nuclear deterrence meant for self-defence of the country. This is like a guilty party filing the suit first. The G-7 summit is a place where those nuclear- and missile-haves put their heads together to discuss how to pressure weak countries and those incurring their displeasure. 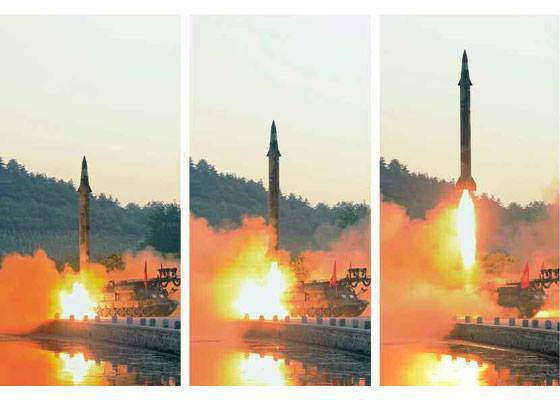 The U.S. and its followers are seriously mistaken if they think they can deprive the DPRK of its nuclear deterrence, the nation's life and dignity, through sanctions and pressure. 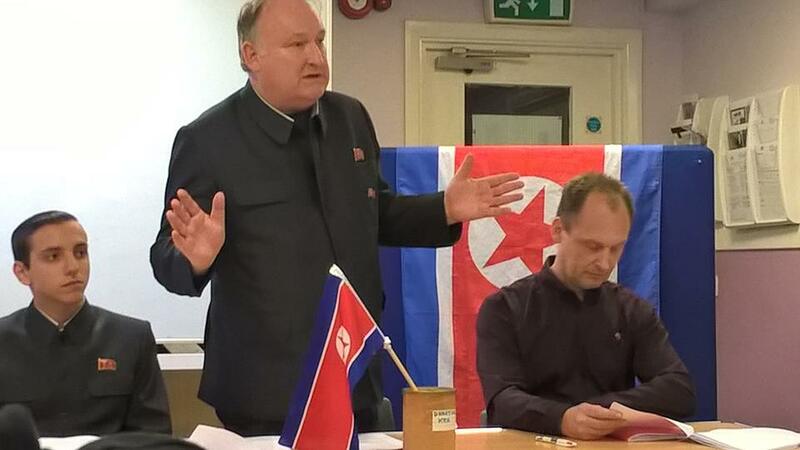 The Association for the Study of Songun Politics UK, the Juche Idea Study Group of England and the UK Korean Friendship Association held a meeting on the 20th of May at 2pm in central London to report back from the recent visit to the DPRK and to express full solidarity with People's Korea against US and wold imperialism including supporting the rocket test of the DPRK . The meeting was attended by members of the ASSPUK, JISGE , UK KFA and also the general public. Dr Dermot Hudson President of the ASSPUK and Chairman of the JISGE said that " Before we travelled to People's Korea there were all kinds of crazy reports of imminent war on the Korean peninsula and talk of a US aircraft strike carrier group heading towards the DPRK to mount a pre-emptive strike on the DPRK . There were rumours of all flights been cancelled and of Pyongyang being evacuated. This proved false .Pyongyang was full of people both Koreans and foreigners , aircraft were flying and there was a calm , peaceful and almost dreamy atmosphere. No one we spoke to was worried or frightened by Trumps threats .No one cared a fig for what Trump was saying.Everyone was calm and strong. In many parts of the globe imperialist aircraft intrude into the skies but in Pyongyang and other parts of the DPRK the skies are free from imperialist aircraft , indeed visiting the Fatherland Liberation War Museum we saw the wreckage of the EC121 US imperialist spy plane shot down by KPA fighter aircraft on the 15th of April 1969..... Undoubtedly the high point of the visit was the April 15th grand military parade and mass civilian demonstration. That day rain had been predicted but instead the weather was bright and sunny leaving us with a slight sun tan . The parade was attended in person by dear respected Marshal KIM JONG UN , chairman of the Workers Party of Korea and Chairman of the State Affairs Commission of the DPRK . Before the parade started vice-chairman of the State Affairs Commission of the DPRK and vice-chairman of the WPK comrade Choe Ryong Hae made a speech which pointed out that " The U.S. is creating the phase of a war while resorting to frantic nuclear war provocation moves against the DPRK, the speaker said, stressing that if it makes reckless provocation, the Korean revolutionary armed forces will immediately mount an annihilating blow and answer an all-out war in kind and a nuclear war with Korean-style nuclear strike.". The parade was most disciplined, precise and yet at the same time enthusiastic and buoyant. We saw detachments of armed university students marching. The DPRK has an all-people defence system so that in the event of war everyone will take up weapons and fight the US imperialists to the last person. Our delegation called on the Pyongyang Mission of the Anti-Imperialist National Democratic Front of south Korea(AINDF), the underground revolutionary organisation of south Korea which upholds the great Juche idea. We conversed the head of the mission comrade Zo Il Min in a friendly and cordial manner. We were shown videos showing the just struggle of the south Korean people against the corrupt and despotic Park Geun Hye regime and also the aggressive warmongering exercises of the US imperialists and south Korean puppets as well the struggle of the south Korean and world progressive people. We had a discussion on how to best support and invigorate the struggle of the south Korean people and the AINDF for independent reunification. We were entertained with a wonderful meal including the excellent kochugang hot pepper sauce . Militant anti-imperialism was very much an integral part of our visit . We visited the Fatherland Liberation War Museum which details both how the US imperialists provoked the Korean War and the defeat of the US imperialists. We also visited the new expanded and reconstructed Sinchon Museum . I had visited it in October 2015 but it was the first time for the other members of my delegation to see it. Here we learnt in graphic detail of the barbaric and sub-human atrocities committed by the US imperialists against the innocent Korean people. We saw anti US posters and the song "Death to the US imperialist aggressors " was being played over the PA system as background music. I addressed a revenge pledging gathering of Korean people becoming the first foreigner to do so. ! Shaun Pickford secretary general of the JISGE and chairman of Staffordshire Korean Friendship Association said that " On arriving in Pyongyang, I found the atmosphere in the DPRK to be very tranquil and stable, a million miles away from all the hysteria generated by the Western mass media. Indeed the DPRK is a society free from crime, poverty, disorder and terrorism. The renovated Pyongyang International Airport made for a pleasant passenger experience, the new Pyongyang airport was opened in July, 2015. Compared to other international airports, the one at Pyongyang combines efficiency and friendliness. To say the DPRK is isolated, is complete nonsense, as I encountered tourists from many countries at the airport, including from the British based Saga Travel. One ambition of mine was realised, when I had the chance to visit The Kumsusan Palace Of The Sun, on my other DPRK trips I was unable to go there. The modern history of Korea and the global struggle for social progress is inconceivable without the leadership of President Kim IL Sung and Chairman Kim Jong IL. As somebody who has been studying and disseminating the Juche Idea for many years, I wanted to pay my respects to the teachers and leaders of human emancipation, Kim IL Sung and Kim Jong IL. It was really poignant that in the afternoon of April 15th, the Day of The Sun, I that paid my regards to the Great Leader President Kim IL Sung and the Great Leader Chairman Kim Jong IL, with a sincere heart. I silently wished the Great President a happy 105th birthday and knew that Kim IL Sung behests will be eternal. I felt particularly emotionally on seeing the final resting place of Kim Jong IL, who passed away in December, 2011 on a moving train in the course of his revolutionary activities. The Kumsusan Palace Of The Sun was opened on July 8th, 1995 and was further refurbished by the order of Kim Jong Un in 2012 so as to perpetuate the memory of Kim IL Sung and Kim Jong IL as the Suns of Juche. To understand the acute situation on the Korean peninsula, a visit to The Sinchon Museum in South Hwanghae Province is required. The original museum had been reconditioned in 2014 and has many graphic reconstructions of those events. As I entered the grounds of the museum, I was confronted by the sheer horror of those occurrences more than sixty years ago. On one side of the steps leading to the museum's entrance, there is a mass grave containing the bodies of mothers and on the other slant, a collective grave for the children's bodies. 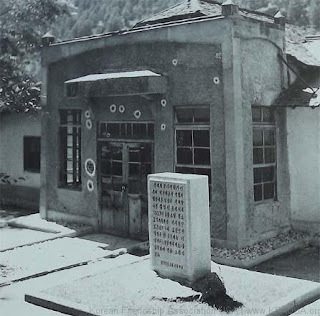 Even before entering the museum building, I had to get to grips with the atrocious nature of US Imperialism"
David Munoz de Castro UK KFA organisation secretary said that " could see many changes during our way from Sunan to Pyongyang.New houses, repainted houses and peaceful villages. On the arrival I could see the already built Ryomyong street. When we visited the DPRK last year they had not even started with the construction. They were not the only thing I could see from my route to the hotel. I could see new buildings and very modern built throughout the city and others in the process of construction. Upon arriving at the hotel we realized that it had been rebuilt and improved with a model statue of the hotel in the center of the reception. During our visit we were able to visit many places that we had not had the opportunity to see last year like the Orphans Primary School. I remember that last year was still under construction. There we could see the excellent conditions in which the orphans live. Unlike the poor conditions in which they live in capitalist countries where the resources do not reach them or to have the opportunity to study and where the only hope of the orphans is that they are adopted by a family with money. In the DPRK the orphans live a life equal to others, with education and a dignified life with the same opportunities and where the state takes care of them as part of the vanguard and future of Korean socialism." US imperialism should the US imperialists provoke a war . 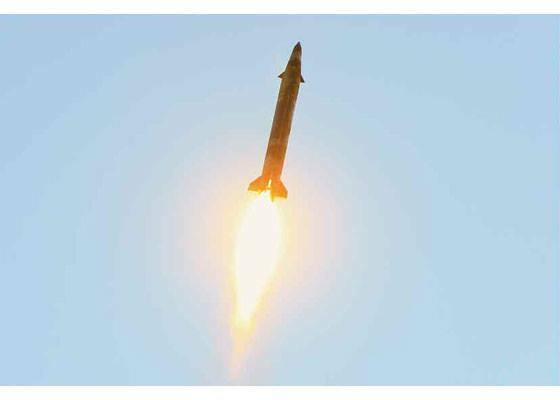 Indeed the Hwasong-12 rocket test shows that the DPRK under the leadership of dear respectedMarshal KIM JONG UN is holding fast to the revolutionary line of Songun by defying the threats ,diktat and bullying of the US imperialists . 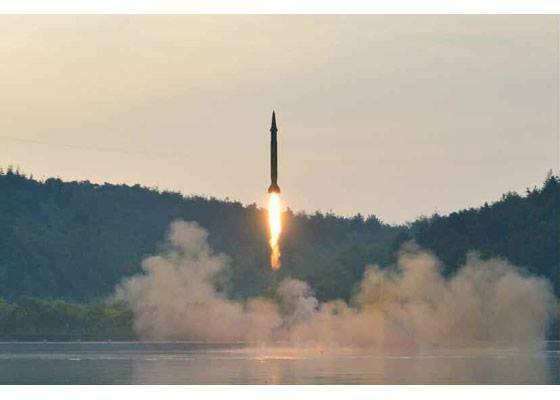 The DPRK was totally unbowed by the successive UNSC sanctions that have applied to the DPRK since 2006. Honest minded people have to admit that it is only the DPRK in the world that is standing up to US imperialism and is not afraid of it ." Other speakers and participants in the meeting denounced US imperialist war threats against People's Korea and called for increased solidarity such as pickets etc . Dr Hudson spoke about the Kwangju uprising against the south Korean puppets and US imperialism in 1980 saying that "The Kwangju uprising, which lasted 9 days , added a new chapter to the history of the struggle of the south Korean people for independence ,democracy and reunification . The participants of the Kwangju uprising showed remarkable courage and determination in the face of intense fascist repression by the south Korean puppet reactionaries and the Yankee imperialists." Dr Hudson also said that "the US imperialists are the true author of the Kwangju massacre. US imperialism has the blood of 5,000 south Koreans on its hands!" . It was stressed that south Korea is stil a puppet regime of the US despite the change of 'government' and that US troops must be withdrawn from south Korea . It is important to step up the struggle to support the AINDF the vanguard of the south Korean people . A solidarity resolution was adopted and also a message to the dear respected leader Marshal KIM JONG UN . A exhibition of the works of the great leader President KIM IL SUNG , Chairman KIM JONG IL and respected Marshal KIM JONG UN as well as books on the Juche Idea and Songun idea and the publications of the ASSPUk, JISGE and UK KFA was held. Pyongyang, May 30 (KCNA) -- The deputy permanent representative of the DPRK mission to the United Nations called a press conference on May 26 as regards the issue of formation of an international forum of legal experts to clarify the legal ground of UNSC's "sanctions resolutions" against the DPRK. 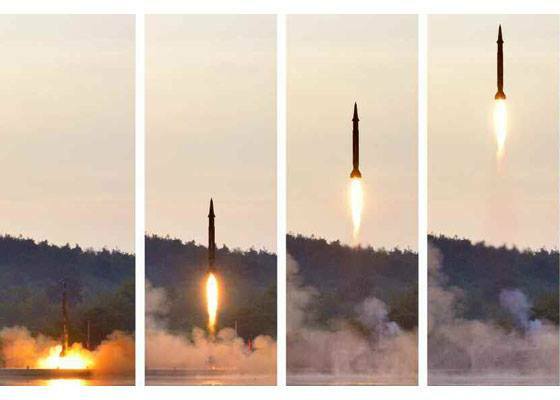 He condemned the U.S. and its vassal forces for pulling up the DPRK over its steps for bolstering nuclear deterrence for self-defence, including the recent successful test-fire of ground-to-ground medium-to-long range strategic ballistic missile Pukguksong-2. Noting that the UNSC and the UN Secretariat are blindly following the U.S., he said that they must clearly distinguish who is responsible for the current critical situation on the Korean peninsula and should behave in fair and with cautions. We made several requests to the UN Security Council to discuss the issue of the joint military exercises that intimidate the peace and security on the Korean peninsula as its emergency agenda. And we sent letters to the UN secretary-general as well, demanding him to bring the attention of the issue to the Security Council. However, the UN Secretariat turned its back to our fair requests, and rather picked a quarrel only with our legitimate exercise of the right to self-defence against the U.S. nuclear threats and blackmails as violation of the "sanctions resolutions". It has so far kept silent to our requests to organize an international forum of legal experts for clarification of legal grounds of the "sanctions resolutions". In order to put an end to the illegal and inhumane evil conduct continuing like a traditional practice in the UN Security Council, the permanent mission of the DPRK to the UN made a proposal in January 2017 to the UN Secretariat on holding an international forum of legal experts either in New York or Geneva to clarify the legal ground of "sanctions resolutions". 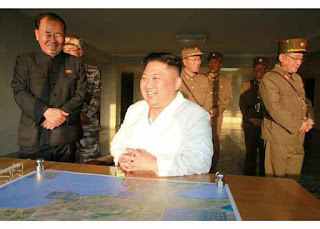 But after our proposal on organizing the international forum of legal experts, the U.S. employed reptile broadcasting service to spin out preposterous sophistries about the legal ground of "sanctions resolutions" against the DPRK, quoting the non-expert opinions of those who are unaware of even international laws. If the United States has anything to say, they should come out and speak out at the international forum of legal experts, instead of spreading unreasonable words by using those who do not even know about international laws. The reality fully shows that organizing the international forum of legal experts to investigate the legal ground of ''sanctions resolutions'' is all the more pressing. The international forum of legal experts is a place where the legality of ''sanctions resolutions'' can be clarified fairly from the international law perspective. In March 2017, the permanent mission of the DPRK to the UN proposed to the UN Secretariat that the governmental and non-governmental experts from all states and international legal organizations could attend the international forum as they wish and the agenda of the forum could also be agreed upon reasonably in full reflection of the wishes and opinions of the attendants. These kinds of requests for international forum of legal experts have been made to the Secretariat for over 20 times afterwards in various ways through such as letters to the Secretary-General, press statements of the mission, press conferences and interviews. Now we are totally disappointed at inability of the Secretariat that could not even make decision of the issue organizing the international forum of legal experts, and it is quite absurd that the Secretariat, which could not make clarification of the legality of the "resolutions", still claims for any implementation of them. 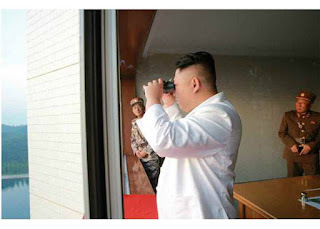 The Secretariat of the UN, whose basic mission is to ensure global peace and security, should fulfill its responsibility before the international community by positively responding to our proposal for organization of the international forum of legal experts to clarify the legal ground of the "sanctions resolutions" against the DPRK. Build a society for workers! Support UK KFA ! Defend People's Korea !